Nursing staff caring for people with cancer have raised almost £3.000 to help people spend their final days and hours with their loved ones. Ward 30 at the Queen’s Centre at Castle Hill Hospital provides recliner chairs so relatives can stay next to their family member as they approach the end of their lives. However, staff held a Disco Fever night this month to raise £2,800 to pay for camp beds so relatives can rest properly next to the people they love. Health care assistant Julie Simpson and clinical support worker Sue Hemsworth worked together to arrange the fundraising event at the Good Fellowship in Cottingham Road, Hull, collecting raffle prizes and gathering donations to reach their target. Although the ward has a hospitality suite, staff realised families were reluctant to leave the bedsides of their loved ones but were exhausted without sleep. Staff, who raised more than £1,000 last year to pay for an ECG machine to help patients, hope to be able to buy at least eight camp beds. 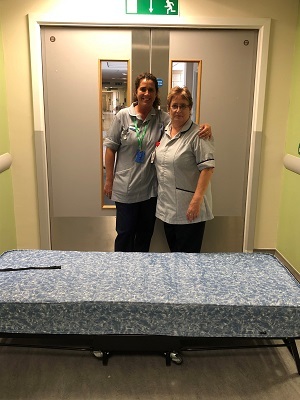 They have also received two beds from Hull and East Yorkshire (HER) Breast Friends, a proactive charity helping people whose lives have been affected by breast cancer.